I went to Swan Lake this morning, then took a quick walk around Totem Park before picking Rowan up from preschool. Weather: Mostly cloudy with a little bit of sun this morning. Winds were calm. Birds: At Swan Lake I saw two American Coots, a Cackling Goose, several scaups, probably some Ring-necked Ducks, and (the highlight of the day) a Pied-billed Grebe. Also while I was at the lake, I noted a Ruby-crowned Kinglet foraging in the nearby bushes and trees. 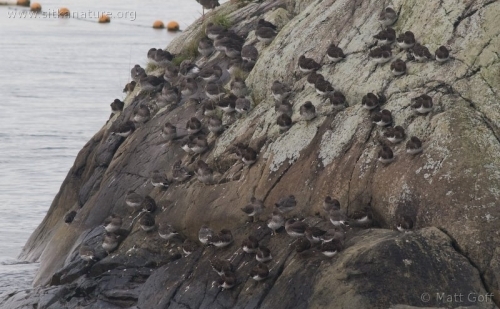 On the way to Totem Park I saw about 90 shorebirds on Sage Rock, evenly split between Surfbirds and Black Turnstones. Also there were several Harlequin Ducks, some gulls, a couple of Common Mergansers, a Double-crested Cormorant, and a Pelagic Cormorant. A Great-blue Heron was perched on one of the pilings at the outflow to the hatchery. At Totem Park I saw some Surf Scoters and a couple of Buffleheads off shore. I saw what I am pretty sure was a falcon flying from the direction of the river along the shore out over Crescent Bay. A crow momentarily gave chase, and I saw the falcon was at least as large or larger than the crow. This would suggest that (assuming falcon is correct) it was a Peregrine Falcon or a Gyrfalcon. Given location, it would almost certainly be a Peregrine Falcon. I did not get a great look at it, but the bird did seem quite dark. It over toward the islands, made a brief, half-hearted attempt at a storm-petrel along the way, then turned toward Morne Island and, as best as I could tell, it landed in the trees there. At the river mouth I saw another pair of Buffleheads. Other Notes: I noticed a Yarrow in bloom on the rocks above Sage Beach. I also noticed that the Villous Cinquefoil all seemed to have small new green leaves and all of the larger leaves (presumably from spring and summer) were brown and dead. I have not previously noticed new fall growth, though it certainly would not surprise me if it were typical. It seems strange that the plants would invest energy in new leaves this time of year, however.